President Trump says that if Mexico, Canada and the United States can't renegotiate a trade deal, "it'll be terminated and that will be fine." "I think Justin understands this, if we can't make a deal, it'll be terminated and that will be fine," Trump said Wednesday. "They're going to do well, we're going to do well." Trump added that he would pursue a separate trade deal with either Canada or Mexico if his administration couldn't reach a deal with both nations. "It's possible we won't be able to reach a deal with one or the other but in the meantime we'll make a deal with one," Trump said. "But I think we have a chance to do something very creative that's good for Canada, Mexico and the United States." 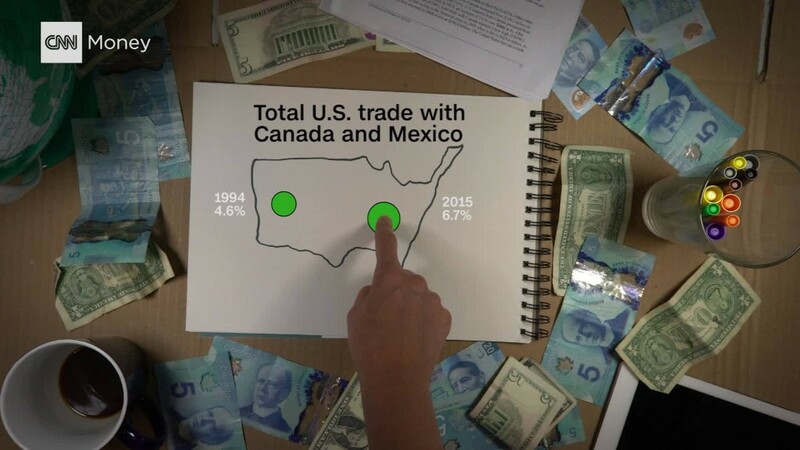 That's not entirely unprecedented: Before NAFTA became law in 1994, the U.S. and Canada had a free trade deal in place. NAFTA then superseded that. Since, businesses have built supply chains across the region. Tearing up NAFTA would disrupt how companies build products. Trump's comment came as the fourth round of NAFTA negotiations began in Washington on Wednesday. Trump routinely blames NAFTA for the loss of millions of American manufacturing jobs to Mexico. He calls it the worst trade deal in U.S. history. "NAFTA has benefited millions of people and can benefit millions more," Trudeau said at the Canadian embassy, without Trump, later on Wednesday. Trudeau added that NAFTA could use a "much-needed upgrade." Mexican President Enrique Peña Nieto echoes a similar sentiment: Modernize the 23-year-old deal but don't blow it up. Business groups are growing increasingly concerned about Trump's threats and his proposals for a new NAFTA. In an interview with Forbes, Trump said "I happen to think that NAFTA will have to be terminated if we're going to make it good." If Trump "terminated" NAFTA, the deal wouldn't be dead overnight. His decision would start a 6-month exit process. Trump's comment suggests negotiations could continue during the exit. Mexican leaders have said that starting the exit process will force them to walk away from the negotiating table. Beyond killing NAFTA, Trump's trade advisers are also pushing reforms that many are concerned about. Tom Donohue, CEO of the U.S. Chamber of Commerce, said Tuesday that Trump's agenda for NAFTA has "several poison pill proposals." Among the controversial proposals is the so-called "sunset clause." It would mean that NAFTA would expire every five years unless each country signed back on for another five years. Trade experts say a sunset clause would hurt the deal's credibility because businesses wouldn't be able to make long-term investments with any kind of certainty. The current round of negotiations was actually extended two days in anticipation of, as Trump described, a "tough negotiation."